Yes, Penang has amazing food, be it fusion or hybrid, street or mall, traditional or accidental. And yes, it has amazing desserts too, like the Penang Road teochew chendol for one. Even the age-old ais kacang. Even the humble bebola ais. And don’t get me started on the nutritionally incorrect kuih, be it kuih Melayu or kuih Nyonya or any other crossbreed. The list is endless for those of us who live to eat. And then there are the hawker drinks. The variety of drinks you find at a typical Penang coffee shop clearly matches and may even surpass the variety of food dishes. In both cases, the bold and innovative search for new make-me-rich-quick concoctions is revealing of the Penang brand of entrepreneurism. We’ve got the stirring ambula juice, often with dried sour plum; we’re got eyebrow-raising almond drink, taken hot or cold; sugar cane – pure, watered down, iced or lukewarm; and we have papoh peng, which I assume is Cantonese-Hokkien for “eight-treasures iced drink”, though not to be confused with the eight treasures tea of ancient China, but I am just guessing. And fruit juices (koay chee chiap in Penang Hokkien) have become progressively popular. I suspect the reasons for this are many: people want a change, they want more choices, they are more health conscious than before, and fruit juices are class-trendy. Also, many tropical fruits have joined the common drink list, like dragon fruit, passion fruit, roselle fruit, aloe vera (not a fruit, of course), plus all things citric. And it is up to the imagination of the thirsty traveller and the innovative vendor what mixtures of fruits, nuts and leaves are possible and palatable. The choices do get ridiculous once you start listing the drinks that a standard coffee shop in Penang actually serves – Milo, Horlicks, Nescafe, wheatgrass, honey lemon and chestnut, not to mention soft drinks like Kickapoo, 7 Up and Coca Cola, of course; and then there is barley, hot and cold and mixed with whatever you can imagine. Throw in the beers and the stouts, either canned or bottled, and you get a good idea of how rich and inexpensive the life one lives in Penang is, and how much luxury we take for granted simply because so much is affordable and ubiquitous. When all is said and done though, the eternal favourites are still tea and coffee. These can come as Ceylon or Chinese, with or without susu (milk – fresh, evaporated or condensed) or just plain “O”, and with any amount of killer sugar you wish. You can have them frothy, iced and with ginger. If your imagination fails you or if you are feeling suicidal, you simply mix coffee with tea. Unlike wine connoisseurs who pick white or red depending on whether the meat is white or red, or drinkers who avoid taking a beer after a whisky, Penangites do not believe in limiting themselves with silly notions about social faux pas when they choose sweet drink to suit salt dish. Anything goes. The only rule I have heard of concerning no-go food-drink combos is that one should not drink strong alcohol after durian – but that’s another story. 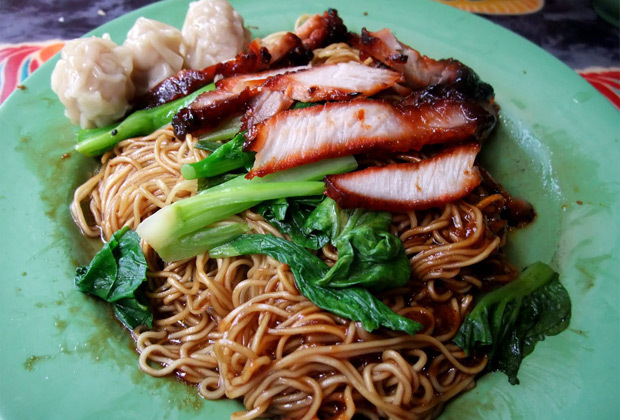 For hawker dishes, you may be advised against taking a koay teow th’ng after a curry mee – the fragrance of the former would not be savoured because the spiciness of the latter would have numbed your tongue. But for drinks, no order to the drinks you down is frowned upon as far as I know. It’s all about individual taste, and strong stomachs. Come to think of it, the Chinese do have one rule, and it is tied to the durian and whisky taboo. Never overdo the “heaty” stuff. Balance hot with cold, rein in yang with yin. Finally, did I mention the wonder drink – coconut water? We must not forget that one really local drink, truly a tropical fruit that cools and comforts in the tropical heat like no other liquid can.